Do your socks really rock? 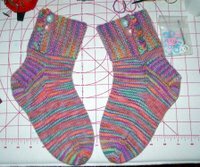 Are you interested in joining Blue Moon's Sock That Rock Club? Sign up notification will begin in November (if you're on their list). Is the Cotton and Acrylic stash piling up? Helping others to Knit for charity! Real Men Knit Something for the guys! Is knitting on it's way out?